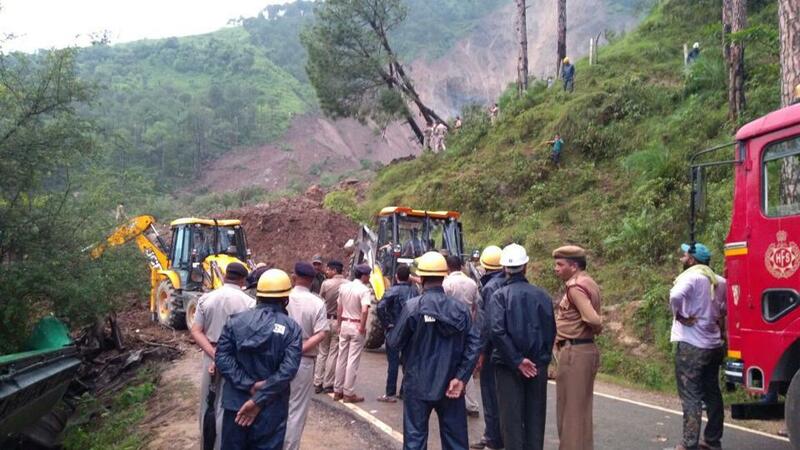 At least 50 people are feared to have been buried alive in a massive landslide that swallowed about 250 metre stretch of road, homes, two buses and vehicles in Himachal Pradesh's Kotrupi village about 41 km from Mandi, on the National Highway-54 around 12.30 am on Sunday. The landslide suspected to be caused by a cloudburst on the hill-top also swept away a car, a jeep and 2 two-wheelers. Twenty-four bodies were recovered and five injured were rescued till the filing of the report. An official said the death toll could rise as the search for survivors continues. At the time of the disaster two Himachal Road Transport Corporation buses had stopped at a kiosk on the highway for refreshments. One bus was going from Manali to Katra while the other was travelling from Manali to Chamba. While the Katra bound bus rolled a few feet down and stuck somewhere mid-way, the debris swept away the second bus over 900 meters down the gorge. Eight passengers were travelling in Manali-Katra bus out of which five were killed while three other sustained injuries and were rescued during the operation. In the second bus, over 40 passengers are feared to have been buried under the debris, he said. Describing the development "an unprecedented tragedy", the Chief Minister, while talking to mediapersons said the rescue operation would continue until the last body of victim was recovered. He also directed local civil authorities to assess the loss to the property at the earliest so that the sufferers could be adequately compensated. The Chief Minister said the topographical condition of the State was such that such incidents could not be averted but the Government would provide whatever possible help to the family members of deceased. Virbhadra Singh also met the bereaved family members and expressed his condolences. Earlier in the day, rescue teams from NDRF and army were called at the scene of the landslide from Kangra to carry out rescue and rehabilitation operation on a war-footing. Deputy Commissioner Sandeep Kadam had also reached the spot with a team of officials including police and doctors. Prime Minister Narendra Modi has condoled the deaths due to the landslide saying, "Pained by the loss of lives due to landslide related accidents in HP's Mandi district. My condolences with the families of the deceased." In a series of tweets, PM Modi wrote that a team of National Disaster Response Force (NDRF) is going to Mandi to take part in rescue and relief operations and provide all possible assistance required. He also prayed for the quick recovery of those injured in the incident.